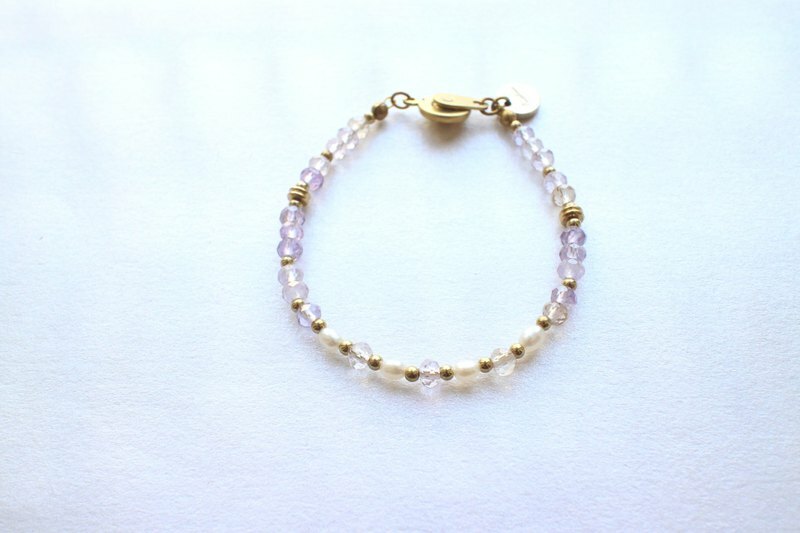 This bracelet is graceful and charming. It is a fantastic and cool accessory. ---- Made of brass,pearls and Ametrine. ---- Length of the bracelet is about 16 cm. ---- If you want to customize this product, please send me a Pinkoi message. ===================================================== **How to measure the length of your wrist** (1)Use a measuring tape to circle your wrist. (2)If the** actual length** of your wrist is 15 cm,please choose **16.5 cm**. ====================================================== **Note to customers** (1) The arrangement of the beads will be a little bit different according to the different length. (2) This is a made-to-order product,which requires 3- 5 working days with holidays excluded. (3) This product is handmade thus each one cannot be 100% identical. (4) It's natural to see different shapes/colors/lusters/lines on each natural stones or pearls. (5) Please allow for some variation in color as displayed on different devices and screens. Actual colors may vary. ======================================================= **Shipping Information** 1. Hong Kong Area: We use **SF EXPRESS** to deliver your package, if your location is not included in Hong Kong business areas or in remote areas, **SF EXPRESS** will charge HK$30 which is not included in the shipping fee of your original order. 2. Other areas: Airmail (will be delivered in 7-14 days.) ===================================================== **Jewelry care** Each piece of Fuchia jewelry is hand-crafted, often with rare and/or unique beads and components, all of which requires delicate handling. After each wear, gently wipe with a soft jewelry cloth and store in a jewelry box. Avoid undue moisture and should your item get wet, make sure to dry it off. You may use toothpaste with a little water to clean the brass part, but do not brush all natural stones and pearls. Before go swimming or taking a shower, don't forget to take your accessories off.